An old stone marker on Beacon Hill, passed on the Cleveland Way after Osmotherley. 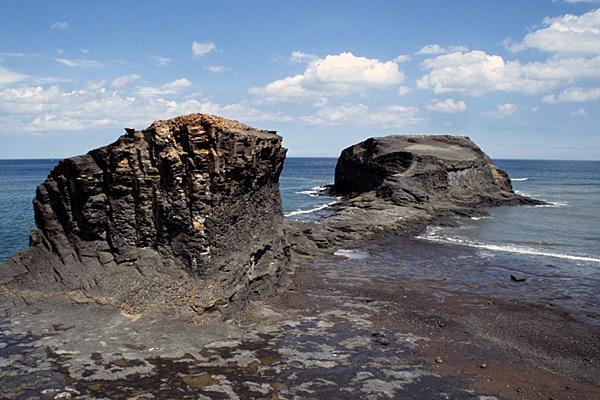 Crumbling alum shale sea stacks at Saltwick Nab, on the Cleveland Way near Whitby. 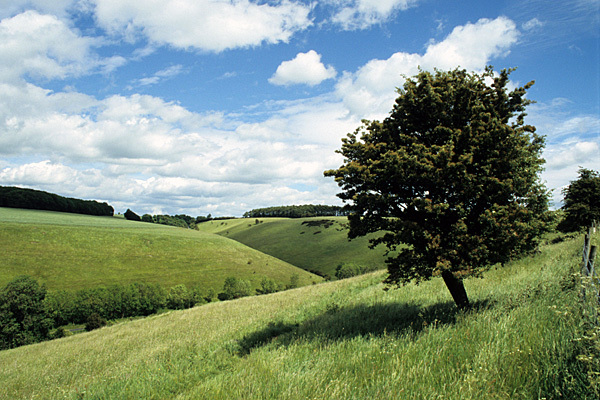 The Yorkshire Wolds Way runs along a grassy brow as it heads for Huggate. This guidebook covers three wonderful long-distance walking trails: The Cleveland Way, Yorkshire Wolds Way and the Tabular Hills Walk. 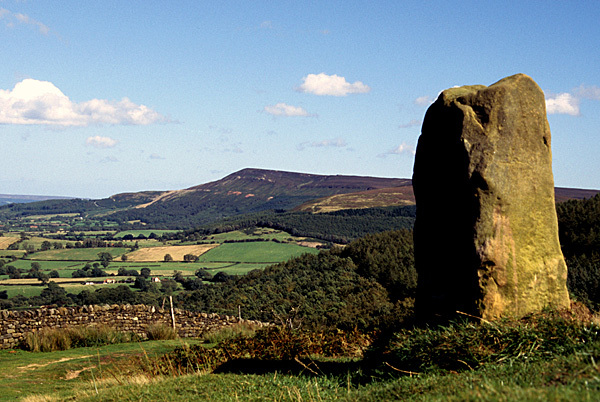 All three trails offer splendid walking in their own right, but they can be connected easily to each other to offer a continuous route exploring this part of Yorkshire, covering over 400 kilometres (250 miles). Cicerone's original guidebook covering the Cleveland Way had gone out of print, and it also covered an interesting route through the Tabular Hills. When the task of producing a new guidebook was discussed, it was decided to add the Yorkshire Wolds Way to the contents. The book therefore contains two National Trails. The Yorkshire Wolds Way runs from south to north through the Yorkshire Wolds, from Hessle, near Hull, to Filey Brigg near Filey. A day's walk north along the coast easily connects with the Tabular Hills Walk, which can be followed from east to west through the southern part of the North York Moors National Park, from Scalby Mills to Helmsley. This allows a connection with the Cleveland Way at Helmsley, which can be followed around the high parts of the North York Moors, descending to the coast at Saltburn. The route then takes in the Cleveland Heritage Coast, linking the coastal resorts of Saltburn, Whitby, Robin Hood's Bay, Scarborough and Filey. The second edition of the guidebook is published in full colour, with the route highlighted on OS Landranger mapping, covering all the routes from start to finish. There are notes about the level of services that can be expected along the journey. The routes were re-walked and checked as one continuous long-distance trail over a period of three weeks, but the book is structured so that readers can choose whether to follow any one, or all of the trails. A separate map booklet is available, covering the course of the Cleveland Way at a scale of 1:25,000.